A personal quest to re-learn how to walk through cherished, northern landscapes introduces a gifted new voice. 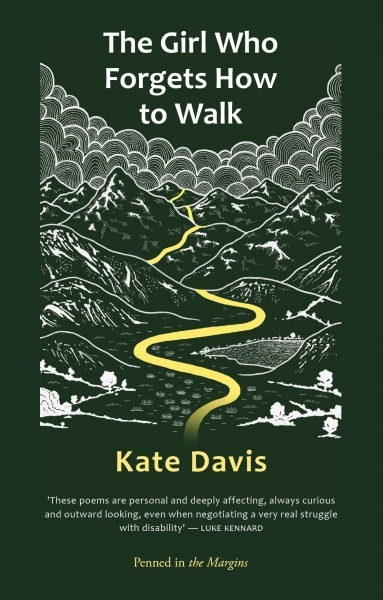 Gathering fragments from memory, myth, archaeology and geology, Kate Davis’s debut is a nimble exploration of what it means not only to exist, but to persist. The Girl Who Forgets How to Walk feels to me incredibly timely. Coming on the back of a surge of so-called ‘new nature’ writing, Davis’s perspective – female, middle-aged, disabled – is refreshing. In what has become de rigueur, a (usually white, male, able-bodied) narrator will be inspired to set off following some river or shoreline, tracing Situationist ambiance onto the terrain in order to offer mild critique of late capitalist ennui. Thankfully, Davis’s book shuns what we might term ‘common denominator psychogeography’ to present the reader with something altogether more fulsome. Split across three sections, The Girl Who Forgets How to Walk is a sustained rumination on how we come to terms with disability and loss. It is also a book charting the wildness of Cumbria and Lancashire and how we, as human actors, figure in the landscape irrespective of our flaws. ‘When they say geology, she sees anatomy’, Davis writes in ‘She examines her fear that the ground is not to be trusted…’, one of a series of poems which has a self-reflexive narrator ruminate on the circumstances that led to her forgetting how to walk. Not to know that ‘the virus in her spine would bring a terrible dream of heat’, such a lack of omniscience is immediately countered in the following poem, ‘The hot, terrible dream’, in which a fragmented narrative uses the run-on line to deft effect, channelling the refracted memories of care and convalescence. Interested in scale and the playing-off of everyday objects of modernity against glacial time, the poem, with its clever ear for internal rhyme, seems to be measuring the personal against the prehistoric (the ‘Costa […] mocha’ against the ‘Permo-Triasic rocks’). The last poem in this introductory section, ‘Disaster’, sees Davis toying with line lengths, foregoing a conventional account of a train crash which ‘everyone remembered’ to instead focus on the surreal image of the ‘whole train falling slowly’ into a sinkhole. I have not copied verbatim Davis’s use of line and even word breaks here, but it should be noted that their cumulative effect makes for a kind of stalling: the blunt terror of a one-hundred foot chasm opening in the earth and swallowing a carriage full of people is apprehended. Are we – is our narrator – certain that this disaster actually happened? Two preceding poems would have us be sceptical. We begin to wonder if it is animism – the ‘troll teeth’ in the ‘mouth’ of the pit in ‘Limekiln’ – or myth and folklore – the ‘stories of farmers’ in ‘Haematite’ – which is at fault here, but then Davis seems more intent on the bigger picture: might both be different sides of the same coin? The fallibility of memory and the impermanence of apparently-solid elemental structures are routinely clashed together. By the time we reach its closing section, images and motifs have begun reappearing. While this forms a pleasing narrative arc – this is one of few collections which I’ve felt obliged to read in order – it also makes for thematic unity; some order amid the chaos of circumstance. ‘The Taxidermist’s Apprentice Discovers Palaeontology’ sees the return of the pink dress in ‘Peninsula’, while ‘gigantic bones’ and ‘jelly-fish in a warm viscous sea,/tree-ferns decaying to sediment’ remind the reader of the cornucopia of ‘certain creatures’ met elsewhere in the collection (‘Bodies’). geologists gave it — Boulder Drift. You can find out more about The Girl Who Forgets How To Walk from Penned in the Margins.